Providing you the best range of screw conveyor with effective & timely delivery. Along with other material handling equipment, we provide our clients with Screw Conveyors of optimum quality standards. Designed and manufactured to ensure durability and efficient performance to the end user, our screw conveyors are reckoned for low maintenance cost. These equipment are manufactured using mild steel plates, and are useful in the efficient functioning of the oil mill plants. Offered in various sizes, capacities and specifications, these screw conveyors find extensive usage in the feeding of seeds and cakes. Customization facility is also provided. The screw is enclosed in a flexible or rigid plastic tube, or a rigid steel tube, which is driven by an electric motor. Screw is normally located at the discharge end of the conveyor. A removable clean-out cap is placed to cover the intake end of the conveyor tube, enabling the conveyor to rapidly empty and flush. Also helps in the disassembling and washing down of the components. Our company also offers industrial conveyor as a solution in the material handling equipment. Our range of conveyor is designed and manufactured to give high durability and efficient performance. Our range of conveyors is rich in reliability and thus helps in the reduction of the maintenance and cost of the equipment. Our industrial conveyors are useful in the functioning of the oil mill plants. These are used in the feeding of seeds and cakes. Our conveyors are available in various sizes, capacities and specifications. Our company also offers customization facility to our clients as per their needs and requirements. 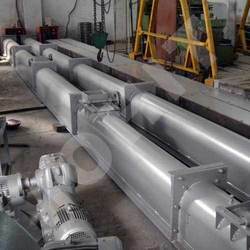 In our conveyor, the screw is enclosed in a flexible or rigid plastic tube, or a rigid steel tube, which is driven by an electric motor and is normally, located at the discharge end of the conveyor. Also, a removable clean-out cap is placed to cover the intake end of the conveyor tube, thus enabling the conveyor for rapid emptying and flushing tube. It also helps in the disassembling and washing down of the components. Thus, making our range of conveyors more appropriate for the related industries.